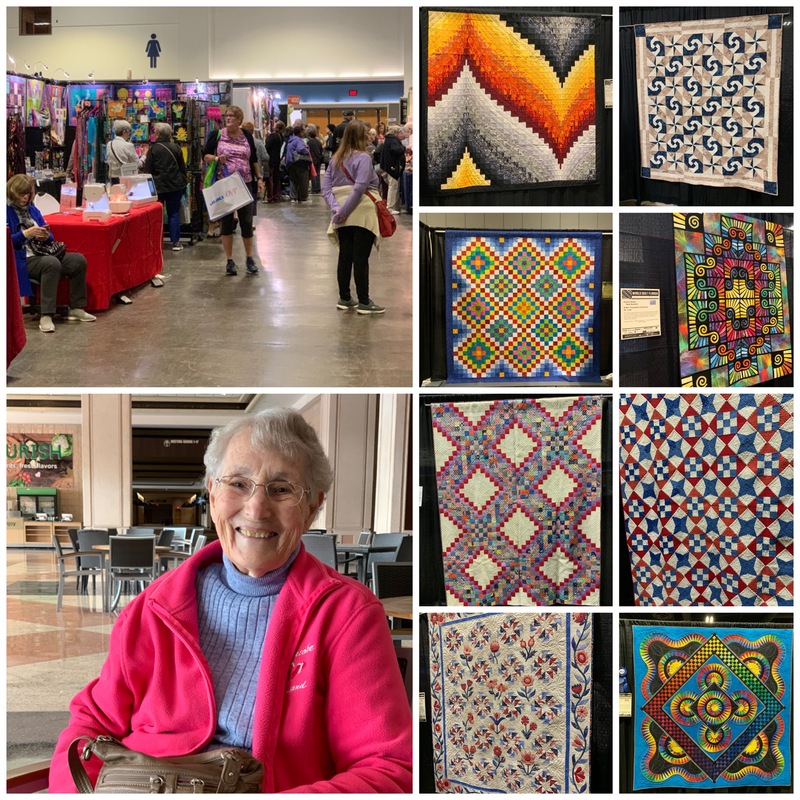 Gail had written to tell me about a quilt show here in Tampa and when I looked it up, I found it was one of the Mancuso shows at the convention center which is just down the street from us so we decided if Mom was up to it, we would go over briefly to check it out. It wasn’t too crowded which was nice. Like other Mancuso shows, I find it’s heavily skewed toward art quilts but we found some quilts that appealed to us. We also had a few purchases, I subscribed to a couple magazines – I’d let all my magazine subscriptions lapse years ago but I’m willing to give them another shot at inspiring me. We also saw a demonstration of a steam iron and both ended up buying one. While I wouldn’t use it for piecing regular blocks, it will work great pressing yardage or scraps when I’m starting a quilt and I think it will be great for a final pressing of a top before quilting too. Who knows, I might even use it on my clothes! Even though I’m on “no buy” I did buy a bundle of 1 yard pieces that came with a free pattern – it had a cute dinosaur print and I’m going to make one more attempt to make a quilt for Caleb – apparently he prefers blankets that feel really soft like fleece ones so I’ll back this one in Minky and see if he approves! Never been to one of these shows, but looks like you guys had fun and found some good stuff too. Mom looks like she’s enjoying herself. Let’s hope you didn’t tire her out!! Wouldn’t want her have a relapse. We are going to a local quilt show tomorrow morning. Excited to see what’s there. Wintering down here in Alabama and I’ve been to this quilt show before, always beautiful quilting. Your Mom looks like she is feeling better. So glad. What iron did you buy? Just curious. I would love a good iron. Just got a new Oliso and love it. BUT, when I am in Maine where I don’t have one, I wanted to leave my Rowenta flat on the board…yikes. Hope you enjoy yours – please review it when you have had it a bit. Glad your Mom was up to going and it was not too crowded. Looks like you picked the best time to go to the show. I love shows but do not enjoy crowds of any kind. Nice to be able to actually see the quilts. Happy you had a good time. I’ve really enjoyed seeing the photos of your mom’s visit. It looks like the two of you have a special connection and enjoy each other’s company. Would love to read a report on your new iron.